This was one of my favorite jobs from last year. 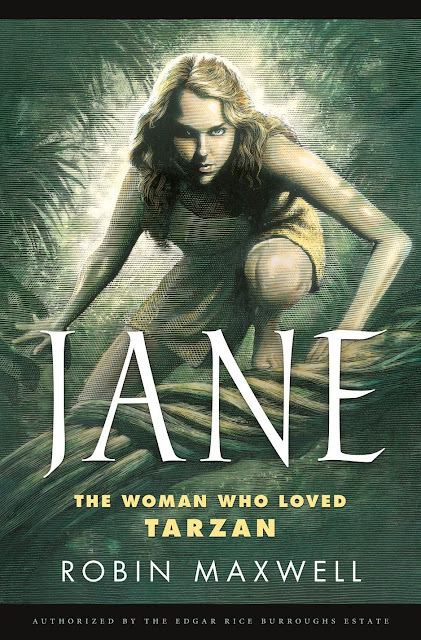 A book cover for a modern update on the Tarzan legend that focuses on Jane, for Tor Books. Initially there was some talk about Jane teaching Tarzan how to shoot a bow, so I started with that. On the second set of thumbs, I realized it should be more about Jane, front and center, Tarzan as backup. 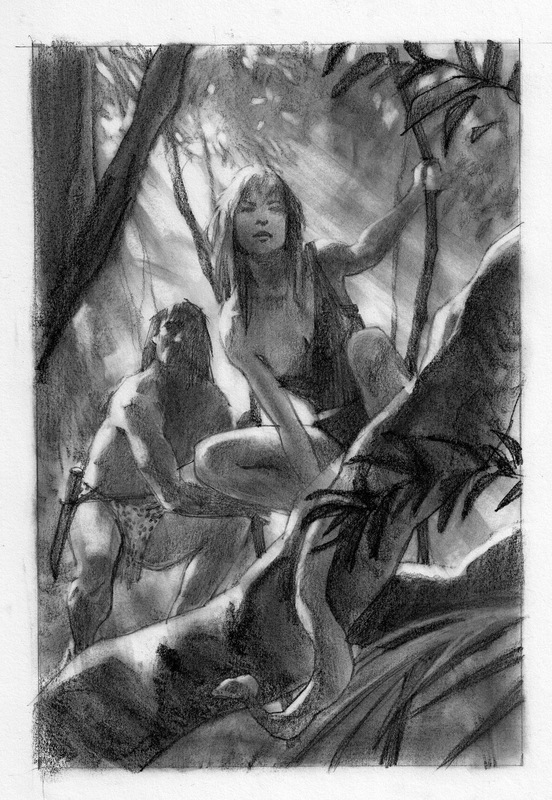 for the jungle and figures, and freehanded this sketch, while studying the reference. I was asked to change the two-piece she’s wearing for a one-piece. ● and...please make her clothing a two-piece.....! 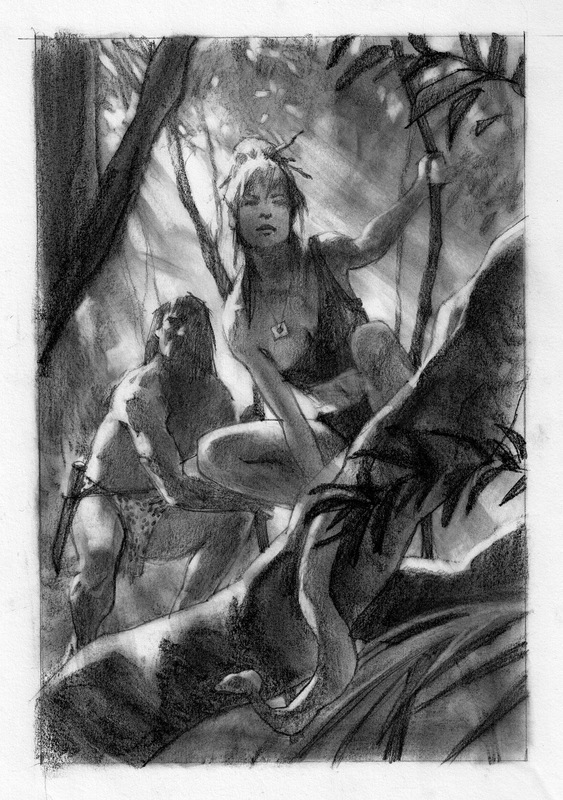 Final sketch. I was quite happy with all of the changes. I took out the snake in the finish. I painted the final and Irene had it designed to give it a bit of an old look. 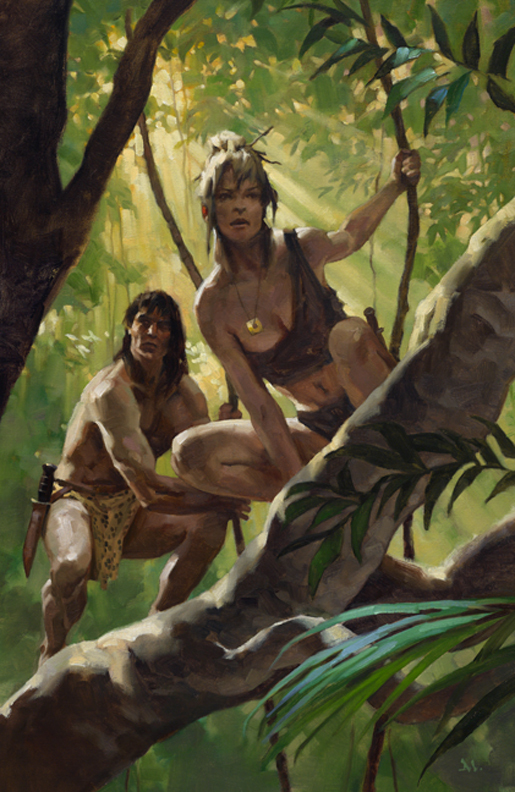 I loved it...pre-stressed cover! But I noticed a problem: something was wrong with her anatomy now that her hair was off her shoulder. 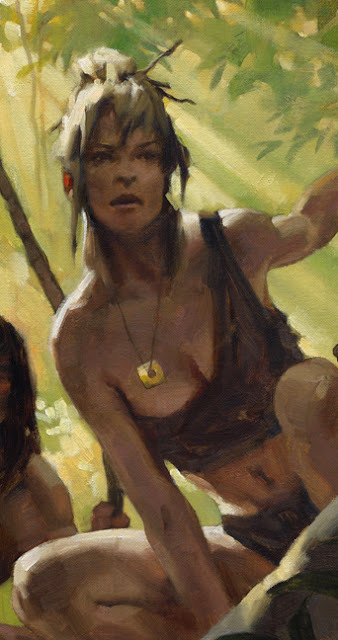 (you can see it above) I thought it was her head, and was about to completely repaint the head all over again, shifting it slightly left, when I showed it to my friend, David Grove. He looked it over slowly, then said, “wait...wait...it’s not the head. That’s a nice head. It’s the shoulder....something about--” He pulled out a pencil and some tissue and laid it over the painting. In a few seconds he had reshaped the socket. I instantly saw the problem. Back at the studio, I managed to correct it in about a half hour. Irene loved it. The ERB estate loved it. 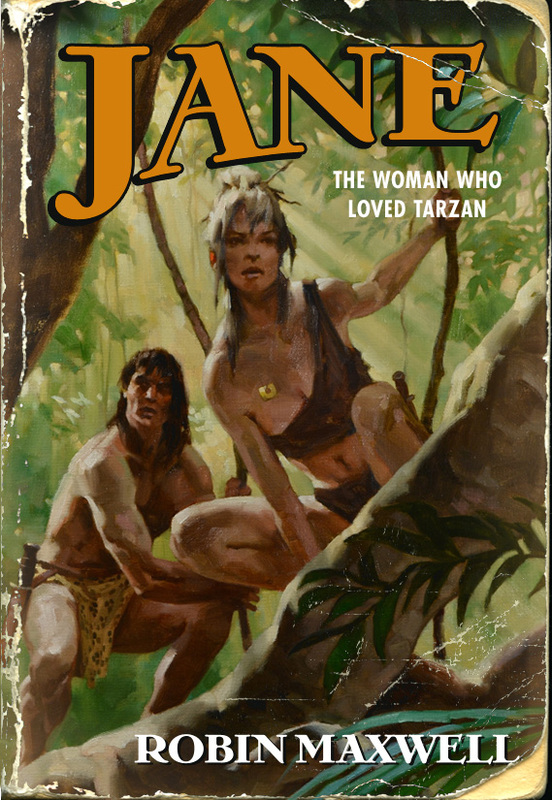 They wanted a more contemporary feel for the more contemporary attitude of the book. Despite the great time I had working on it, and my desire to see it published, I saw their point. These things happen. Irene chose my good friend, Mark Summers, to complete the task. Even though we were friends in the middle of competing for the attention, competing in the market at large, and my wanting to drive to Canada to snap all of his scratchboard nibs... he did a superb job. Ultimately, I was glad a friend and great artist got this one. Sometimes, ya just gotta let stuff go. There will be more opportunities down the road.